The future will be browsed! 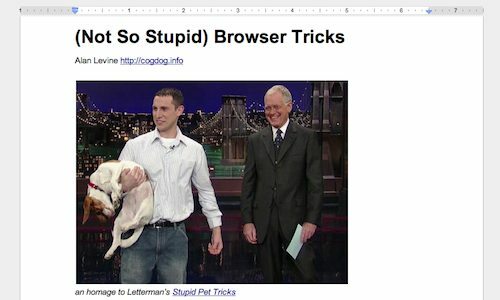 I’ll share ten lesser known techniques or web tools you can use in your web browser to may impress your friends and co-workers, or make you more powerful on the web. Know them all? Share yours! My idea was to show a sampling of stuff I use regularly or every now and then in my web browser- the kind of thing that is either something you did not know, say Google Docs could do, or some other web tool that did something unique in the “tool” sense. It is a squishy definition. It is the kind of thing toy might show a colleague or teacher, and then respond, “Cooooooooool” and think you are some sort of technical guru. You can see my draft as a Google Doc http://bit.ly/browsertricks and in my lamest Alec Couros-ian fashion, if you want to add a trick or edit mine, just use the share button in the top right to request access. If that fails, I may have to perform some frisbee acrobatics.